This Website was last updated:- Oct 24 2015. 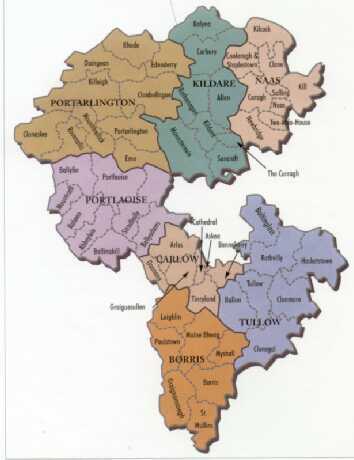 The originally independent dioceses of Kildare and Leighlin were united in 1678 on the recommendation of the Primate Oliver Plunkett. Kildare took its origin from the monastic settlement established by St Brigid in the fifth century. Conleth of Old Connell was its first Bishop, appointed about 490. Their respective feast days are celebrated on 1st February and 4th May. Laserian (or Molaise) is regarded as founder and patron of Leighlin. Having resisted being made chief of his clan, he retired to Holy Island in the Firth of Clyde, Scotland before travelling to Rome where he studied for the priesthood. Ordained by St Gregory the Great, he returned to Ireland and entered the monastery of St Gobban at Old Leighlin. On a second visit to Rome, he was consecrated Bishop and sent back to Ireland as Papal Legate. He was instrumental in having the Irish Church adopt the Roman method of calculating the date of Easter. He died about 639 and his feast day is celebrated on 18th April. Bishop James O’Keeffe (1752-1787) began the building of Carlow College, but did not live to see it in operation. Since 1793 it has prepared students for the priesthood for dioceses at home and abroad. Its Lay College moved to Knockbeg in 1892. Today St Patrick’s has come full circle as it again welcomes lay students from all over Ireland to study Humanities and Social Care. Bishop Daniel Delany (1787-1814) pioneered the apostolate of laity in Ireland and founded two religious congregations, those of the Brigidine Sisters (1807) and Patrician Brothers (1808). Both congregations work in the home diocese, elsewhere in Ireland, and in many places around the world. Bishop James Doyle, O.S.A. (1819 - 1834 was clearly the outstanding eccliastic of his day. His writings – under the initials, J.K.L. – championed the Catholic cause and greatly furthered the work of Daniel O’Connell for Catholic Emancipation. Between 1828 – 1833 he completed the building of Carlow Cathedral. Bishop Matthew Cullen (1927 – 1936), encouraged and facilitated the establishment of St Patrick’s Missionary Society at Kiltegan. The contribution of the Kiltegan Fathers in the development of the African, Asian and American churches has been immense. Today we relive that unbroken bond that connects us back to the earliest Christian gatherings on this island. That living tradition, spanning sixteen centuries, continues to inspire what we do today. 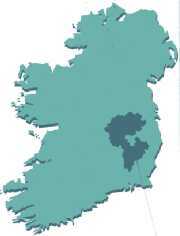 comprises the most parts of Counties, Carlow, Kildare, and Laois, with 5 parishes in Offaly, 2 in Wicklow, 2 in Kilkenny. 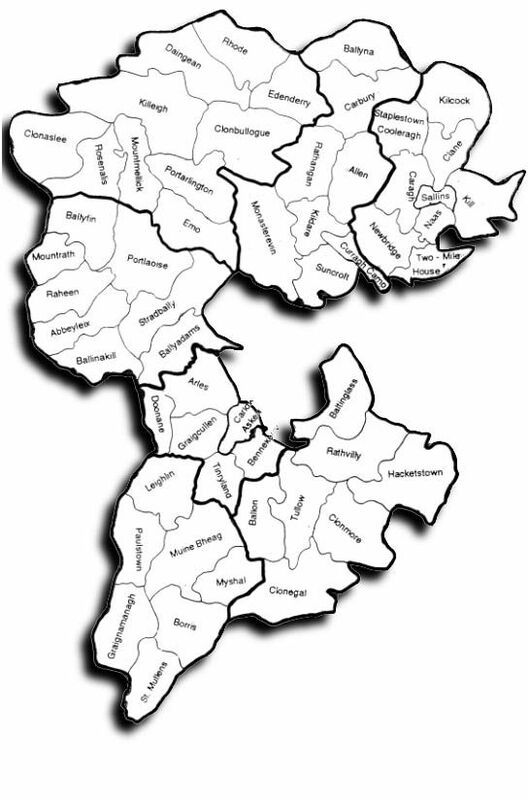 As you can see our diocese is divided into seven Deaneries. Killeigh Parish is in the Portarlington Deanery, which has five parishes in Laoise and five in Offaly [among them Killeigh].